Wampler isn’t a brand that releases a pedal every other day, but when they do we tend to listen. 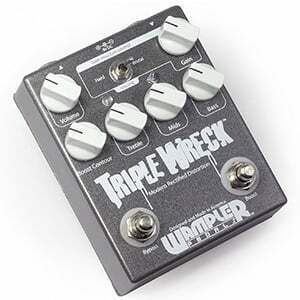 Their Wampler Triple Wreck is easily among the most capable distortion pedals you can get for metal. Just about everything it is optimized for face melting riffs. Lets take a look. The moment you pull this pedal out of the box, you will instantly know that you’re not dealing with just another dist box. Wampler pretty much took the standard distortion design and threw it out the window. Triple Wreck is packed into a wide chassis that looks fairly simple and is devoid of any intricate graphics. Instead, its simple black exterior serves to keeps things clean and orderly. The chassis itself is robust to a point where you could probably use it as a weapon. Needless to say, there is nothing one can do on or off the stage, that could put this pedal out of service. At least not in terms of conventional wear and tear. Inputs and outputs are all in the back, where you will also find the DC adapter port. Keep in mind that this pedal can be powered by a 9V battery despite its size. Controls are probably what gives away most of Wampler Triple Wreck’s attitude. We have the standard Volume and Gain knobs, but there is also a three band EQ underneath. Surprises don’t end there, though. Wampler has installed two specific voicing options for you to choose. These are labeled Hard and Brutal. As you could imagine, each of these offers a different gain curve. Then Wampler went on and did something completely mind boggling. They added a boost switch. Here’s why this is odd. Wampler Triple Wreck is already a gain heavy pedal, but now you have a whole new source of gain to slap on top of its default levels. If we weren’t familiar with this brand and model, a build such as this one would sound completely ludicrous. However, it worked out more than well. Whether it is Wampler’s experience, their ingenuity or just luck, all that gain works. To describe the sound of Wampler Triple Wreck requires some familiarity with one of the best metal amps in existence. From what we have told you by now, you might think that Triple Wreck is just a raw gain pedal that is hard to control and even harder to make a sense of. In reality, this thing sounds pretty much like a 5150 on steroids. Hard mode is full of gain, but fairly easy to work with, while Brutal takes the brakes off the bus. In a way, adding the EQ was almost a necessity. Not only does it help you bring the tone closer to your ideal profile, but it takes care of the entire gain curve, smoothing it out. Wampler Triple Wreck allows you to dial in a variety of tones, making it a much more versatile platform than it appear to be at first. Wampler’s Triple Wreck is one of the most promiscuous, no-nonsense gain machines you will find today. It sounds like a proper tube amp and feels like a beast that’s just about to break free from its chains. With some experimentation, you’ll find that it’s quite a friendly but powerful pedal. For more info about the Wampler Triple Wreck, click here.